Anti-gun ranges aren’t much fun. Tamara and Sayuncle has long noted that being a gunnie is much more fun than being an anti-gunnie. JRC 9mm can be configured for left-hand ejection but that requires partial disassembly and we didn’t have the time. Next range trip will have it set up for left-side ejection. 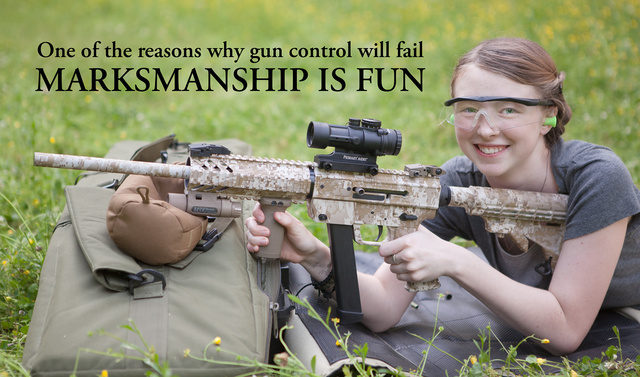 This entry was posted in interesting people, rifle, training, weapon and tagged 9x19, girl, Just Right Carbines, range, smile, teen. Bookmark the permalink. 3 Responses to Anti-gun ranges aren’t much fun. Am I imagining things, or are those foam ear plugs mostly outside her ears and thus not doing much good?